19,998,471 - 10pm Wednesday in Australia! I tried... I sat here and waited but it sort of glitched at 19,999,996 and skipped to 20,000,000. I wish there was a way to see who what number each profile is. Maybe Ales could do it? Isn’t that rather fluid, you would move up and down the ranks depending on merges etc? Yes, we could just say like which one it is in the order the profiles were created though. It could be like the 7 billionth person born. There's no way to know for sure who that was, but they picked a baby girl in the Philippines at random to symbolically represent the 7 billionth living person (although India made their own claim for the 7 billionth person). Yes, but wikitree is a website, everything is on the computer and there are exact times any and everything happened. Congratulations one and all, wow, what an achievement!!! 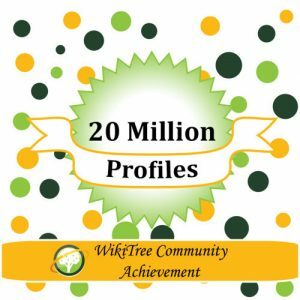 Way to go WikiTree members!!!!!! Proud to say I was a 0.00025% part of that! Ohhhh!! Looks like I better get busy. Hi Dallace! I hit a gold mine in Texas, a collateral line that had lots of kids and sources. Added about 50 or so the last few days. I have been adding a few. I just connected Luke Perry to the big tree and there a lot of relatives yet to add over the next few days. That's great - it is a good feeling to know that Wikitree is going to be around for a long time. I stand by my estimate I gave on the "600,000 members" post: We'll hit 20 million profiles near the end of March. Now it's looking like the 3rd week of March. So today's the morning of the 14th, and it's at 19,897,911. We'll hit 19,900,000 today, moving along at a steady clip of 10K profiles/day, I'll narrow down my guess to March 23rd. (March 24, Slovenia time, which is how WikiTree seems to date things). My math was off. It's more like 9K/day, so we'll hit the big 2-0 on March 27th. Right now we stand at 20,000,425. 19,830,000+ now .. maybe hit 20m at the weekend!? Our tree includes 19,949,416 profiles (5,190,903 with DNA test connections) edited by 606,071 genealogists from around the world. Our tree includes 19,951,070 profiles (5,190,903 with DNA test connections) edited by 606,132 genealogists from around the world. I left census records on those profiles so it’ll be easy to start. Never knew this existed, thanks Greg! Our tree includes 19,976,614 profiles (5,207,313 with DNA test connections) edited by 606,968 genealogists from around the world. I joined 3+years ago when WT was at 8 million. I've never looked back. 20 million here we come! I suspect we'll be at 20 million by tomorrow or early the next day....! Our tree includes 19,989,401 profiles (5,212,756 with DNA test connections) edited by 607,474 genealogists from around the world. The math seems a bit odd. There's currently 19.99 million profiles, the global connections page says there's 15,992,322 profiles connected, but the unconnected people page says there 3,731,137 (almost a palindrome). 15.99 million + 3.73 million = 19.7 million something. What happened to the nearly 300K other people? That’s a good catch, RN! You oughta post that to G2G and see what the tech gurus say about it. Jamie (after someone's suggestion on G2G?) pointed out a problem to me yesterday in the count on the Special:Connection page. We were still using the count for Queen Victoria, but that's off because she is no longer the main anchor. It's now been updated to Henry VIII and displays as 16.2 million. Our tree includes 19,993,858 profiles (5,218,365 with DNA test connections) edited by 607,654 genealogists from around the world. We are at less than 1000 profiles to go! Less than 250 to go. Okay, everybody can stop now. What a great present to us all! I think it is very exciting! Congratulations to all of you out there helping to expand our global tree. Closing in on 18 Million!
? 20,000,000 Easter Eggs - er , Profiles ?